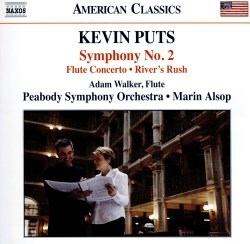 This is my second encounter with the music of American composer, Kevin Puts. Back in 2013 I enjoyed a disc which included his Fourth Symphony of 2007, also conducted by Marin Alsop (review). His Second Symphony is a response to the events of 9/11. As he relates in his booklet note, he was particularly stimulated by a comment of the novelist, Jonathan Franzen, who wrote shortly after those terrible events, “in the space of two hours we left behind a happy era of Game Boy economics and trophy houses and entered a world of fear and vengeance.” The symphony plays continuously but the composer’s note helpfully signposts the course of the music. The work, which is not programmatic in nature, begins innocently and calmly, the music very consonant. Gradually the volume increases, the tone warm and lyrical, until a big and rather noble climax is achieved (6:40). At 7:26 there’s an abrupt cut-off which leaves only a solo violin which muses until a dissonant, short orchestral outburst (8:15). After this outburst has died down the music is fairly quiet but there’s a definite tension in the air which had been completely absent in the opening minutes of the piece. The musical material is similar to what we heard in the beginning but now the tone is darker and troubled. Interestingly, the music seems dark despite the fact that high woodwinds and shimmering percussion are fairly prominent in the scoring. From about 11:30 the music begins to pick up and it becomes increasingly powerful both in nature and volume until at 13:37 there’s a second cut-off. Abruptly, all is still except for the solo violin. This time the violin part is more animated and agitated than was the case first time round. Gradually, however, the violin music relaxes until (at 15:48) the instrument ushers in what Puts rightly terms a “reflective epilogue”. There’s an ambiguity in these closing minutes, it seems, between unease and hope. The very end put me slightly in mind of the conclusion of Shostakovich’s Fourth Symphony, both in terms of the ambiguity and the ticking pulse. This symphony is an evidently sincere composition which communicates with the listener very directly. There follows a short orchestral work, River’s Rush. Puts is a native of St Louis, Missouri, I believe, and the piece was commissioned by the St. Louis Symphony to mark their 125th anniversary. Puts suggests that the piece may have been inspired by the Mississippi river and the way that its appearance varies according to the light playing on the surface of the water. The composer describes a good deal of the music as “big and muscular” and that’s true but this doesn’t preclude the inclusion of calmer, more reflective passages. Within the fairly short timescale of the work there’s ample variety of colour and timbre. In August 2016 Marin Alsop stepped down from the post of Music Director of the Cabrillo Festival of Contemporary Music in Santa Cruz, California. She had served in that post for 25 years. That’s relevant because Puts’ Flute Concerto was commissioned by two long-standing patrons of the Festival. It was premiered there in 2013 and Ms Alsop should have conducted but was prevented from doing so by indisposition. Then, as on this recording, the soloist was the young British flautist, Adam Walker. In 2009 he became principal flute of the LSO at the age of just 21 and on this evidence it’s easy to see why. The concerto is a most attractive piece which is cast in three movements. In the first two movements the flautist, though very actively engaged, doesn’t “show off” too much but rather acts as chief protagonist as the music unfolds. However, a sizeable cadenza in each of those movements gives ample opportunity for pyrotechnics. In these movements the orchestral scoring is commendably light whenever the solo instrument is playing – the scoring is somewhat fuller and, understandably, more excitable in the extrovert finale. Much of the music in the work, and especially in the first movement, can be traced back to a simple melody which Puts apparently sketched as a student. This is heard on the strings at the very start and it’s both lyrical and engaging. The prevailing character of this first movement is lyrical. In the second movement Puts ventures into what he terms the “hallowed environment” of the slow movement of Mozart’s C major Piano Concerto, K467. The music is very clearly inspired by Mozart’s invention though Kevin Puts invests it with his own 21st century “spin”. The results are intriguing and even when Puts moves away from Mozart’s example he still remains within touching distance of it. At 7:57 there’s the most overt quotation from Mozart on the orchestral piano, joined after a few seconds by the flute. The finale is brilliant, fast and strongly rhythmic. Here’s an opportunity for unashamed display – and entertainment – which Adam Walker grasps with evident relish. At 5:55, as the music dances with increasing abandon, members of the orchestra support the flautist with energetic and very precise clapping and this accompaniment – together with more “conventional” orchestral contributions – sweeps the concerto to an exhilarating conclusion. This is a most enjoyable concerto which I should imagine is an excellent and welcome addition to the flute concerto repertoire. Adam Walker is a superb soloist. I enjoyed this disc very much. All the music is accessible, appealing and well-imagined for the orchestra. I think I’m right in saying that Kevin Puts is on the staff of the Peabody Institute. The orchestra of the Conservatory certainly do him proud; their playing is very good indeed. This is their first major label recording; surely it won’t be their last. Here they are clearly galvanised by Marin Alsop, who, on the evidence of this and her previous recording, appears to be something of a champion of this composer. The engineering is by members of the Peabody’s own Recording Arts Department and they’ve done an excellent job.